HALETHORPE – “We’ve got a consecrated altar now,” Father John Williamson, exclaimed to a parishioner greeting him in the narthex of the Church of the Ascension after a Mass May 28 in which the altar was blessed and the new sanctuary was dedicated. Archbishop William E. Lori remarked in his homily that a lot of things changed at the church since he had last celebrated Mass at the parish. The $200,000 renovations were accomplished in about nine weeks between January and Palm Sunday, said Father Williamson, pastor of Ascension and St. Augustine (Elkridge) parishes. A new altar and ambo were installed, with carved-wood fronts. The altar depicts the Last Supper and the ambo, from which the readings are proclaimed, depicts the Ascension of the Lord, which was also the reading for the day for the dedication Mass, on the parish’s patronal feast. The orange carpet throughout the church was replaced with tile. The Stations of the Cross and statues of Mary and Joseph are the same as before, but their backgrounds were redone in blue to match the new color of the wall behind the altar and tabernacle. The tabernacle, which was originally from the Good Shepherd Sisters convent, was restored as part of the 2017 renovations. The corpus for the crucifix was retained, but it is now on a new cross. New candlesticks and new sanctuary furnishings rounded out the interior renovations. Outside, the old bells remain in the bell tower, but they are now accompanied by a new carillon system that pealed both before and after the Mass. In his homily, Archbishop Lori noted that the Risen Lord is present in all the sacraments, especially the Eucharist. Catholics are called to make the Gospel known through their words and actions and to undergo what Pope Francis calls a “missionary conversion” so that they can share the joy of the Gospel, not just as individuals, but as a community of faith, he said. “In other words, our parishes too must undergo a missionary conversion as we seek to reconnect those who, for whatever reason, are unconnected with the Lord and with his body, the church,” Archbishop Lori said. 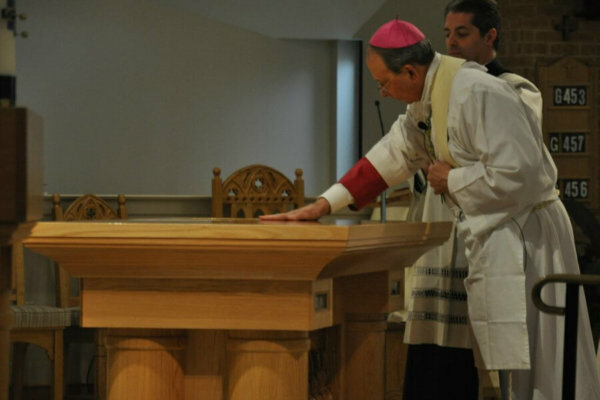 As part of the dedication, the archbishop placed a stone in the altar that contains a relic of St. Genarius, which had been part of past altars at the parish, providing continuity to the past, Father Williamson said. The altar also contains relics that came from the Good Shepherd convent – of Saints Mary Euphrasia, John Vianney, Maria Goretti and Pius X. 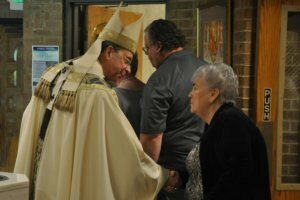 Father Williamson said the parishioners have been overjoyed with the results of the renovations. “Everyone has been very happy,” he said. He said the number of weddings scheduled has doubled now that the sanctuary looks better, which is a good sign that more young people are eager to be married in the church. As of July 1, the parishes of St. Augustine and Ascension will be formally merged into a single parish, the Catholic Community of Ascension and St. Augustine. Father Williamson has been pastor Ascension since 2008 and also became pastor of St. Augustine in 2011. Since that time, the parishes have been working together. 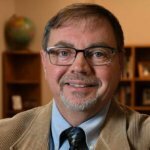 The merged parish will be one of the pilot pastorates in the parish planning process that was announced in May. With 2,200 registered families at St. Augustine and 840 families at Ascension, the combined parish will be one of the largest in the archdiocese.